Most Anglophiles tend to worship from afar. 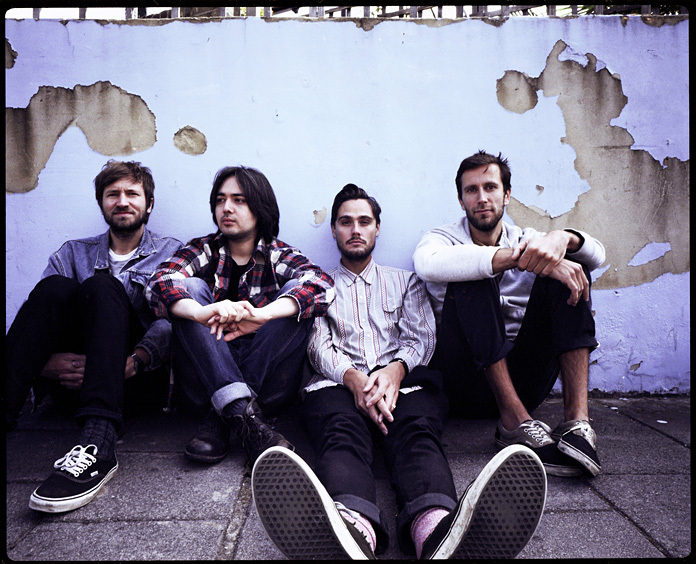 Three of the London-based Cheatahs did just the opposite—vocalist/guitarist Nathan Hewitt originally hails from Edmonton, Canada, bassist/producer Dean Reid is from San Diego, California, and from Dresden, Germany is drummer Marc Raue. The only local, so to speak, from Leicester, U.K., is guitarist James Wignall. Things happened at warp speed for Cheatahs after the recording of their first EP, Coared, in the summer of 2012. Following that EP with another, entitled SANS, the two were packaged together for territories outside the U.K. under the name Extended Plays. They then went on an extensive U.S. tour with Wavves and FIDLAR and recorded their self-titled debut full-length both before and after. Cheatahs stays true to the fuzz and echo the EPs established. Channeling strong Ride vibes, the tumbling cliff faces of reverb are embedded with sinewy melodies with the overall impact of the sound being one of sheer force. Sitting in his London flat, surrounded by walls with many framed images on them, Hewitt could be a character in a Charles Dickens novel—all he needs are some muttonchops. He might be Canadian, but here is where Hewitt is at home. Lily Moayeri (Under the Radar): Three quarters of your band are not from the UK. What drew you to London? Nathan Hewitt: London is full of people that aren't from here. I went on a school trip when I was younger and I really wanted to come back to Europe because they have nice, big castles and they drink beer in the street. I went around touring for a bit and then had a friend who was living in London so I stayed. That was 11 years ago. It's impressive that you have no trace of a fake British accent. I got one after the first three months because I didn't want to stand out. I was 20 and I sounded Irish to a lot of people. I worked in a bar and sometimes it was easier to do the accent because people would get confused about what I was asking them and I knew that if I said it their way, it would be much easier. I got out of that. Are you sick of the musical comparisons you've been getting? Not really. We're a new band so people can't compare you to your earlier work. It makes sense to me. Most of the comparisons are pretty good bands: Dinosaur Jr., My Bloody Valentine, Swervedriver. I love those bands. I'd like to think we have our own stamp on all those bands combined. That's all you can do really—try and make things that remind you of things that you like, that shaped your taste, then you put it through your own filter. How come you didn't have any outside producers working on your music? Because [Reid] can do it. He's got the gear. We have a good rig to record into. At the time we were recording, he had a studio. It was a room with no windows that we could make noise in during the day. We did the drums and a lot of the guitars at Dropout Studios, which is a proper studio. We had it sounding about 80% finished and then we went on tour in the states for six weeks [with Wavves and FIDLAR]. Did things change after that tour? We found playing the songs live was really important. A lot of those songs we hadn't played live before we recorded at Dropout. We changed a bunch of songs, dropped some, and turned some around. We were ready to hand the album in to our label May of last year and they said they wouldn't put it out until January or February of this year. So we spent the whole summer in Dean's windowless studio—the nicest summer in London in 10 years—sweating and reworking the entire thing. How much did you rework? We re-recorded all of the guitars, all of the vocals, and redid half the drums because we found we could get a better sound the way they were set up. We reworked parts too. We would record and then say, that part's not good enough and we want a different part to it or get a better tone. Wrote two songs, cut a couple. It was cool because we had the time to go away and play them. Is the live factor the main reason for all the changes? Yes. There were songs that were the easiest to go immediately and we didn't play them again. We would come back to the studio and say, "that's a cool riff so let's keep it for context, switch it around, and chop it up." Just trying to be as hard on ourselves as possible to come up with something that we're really happy about, and making it fresh because some of it was written about a year before. We didn't have that much time to demo them, or demo them enough. We didn't do enough pre-production. We were doing a lot of the stuff we should have done before we even went into the studio. But, we had only played a couple of shows before the label wanted to do something. We'd only properly been a band for a few months. We'd known each other a long time and we'd been coming up with ideas, but actually just cementing our sound, we had no time at all. Most bands, you do that before and then you go in the studio and record in a week or two because it's all been fleshed out. Next time, we'll do a lot of that before and we'll go in and properly track it. Does your series of four live videos that you released in the month leading up to the album's release represent what you were trying to do with the album? We went back to the studio where we cut the drums at the beginning. There's slightly different editing on each song so it almost comes out as a session. The people who filmed it had a specific style that they were going for. They are putting them together so you can watch all four in a row. Those videos are nothing like the official ones for your singles, which are very unique. What's the degree of your involvement in their development? We were involved with all of them to a certain extent. The first one, "Coared," was before we got signed. We did it really fast, just to have a video, had a lot of friends pitch in, the kids and their parents chaperoning. The idea didn't sound like a music video at all and so sounded really good, and it was the most fun one to do. "Swan" was us trying to salvage another video that was terrible. We had some live footage and a friend had this idea of the ink falling down. That was done in a couple of days. "Cut the Grass" was the same thing, us playing and something over the top, we just didn't now what. "Kenworth" happened at the same time as "Cut the Grass" so we didn't have that much time. But we had the performance and the rest of it we didn't have to do anything. There was still a lot of back and forth trying to get it right. There's a new one coming out soon, for "Get Tight," which we weren't going to be in and then we ended up doing some filming and we're green screened into static. Conceptual videos seem to make more of an impact these days than just one of a band playing live, which you can see from fan videos on YouTube all you want. It's more content for people to get involved in. I've always liked the idea of fleshing out more ideas. I don't know if any of us would say it's been an easy time with videos. We always get it back and think it could be a lot better and work on it more. It's tricky because the budgets are really small. But we're pretty hands on with that stuff. It's almost as close as the music. With all the reworking, it seems like you have a similar attitude with the videos as with the music. When we handed in the record, before we had the extension over the summer, we were making excuses like, "we've only had a couple of weeks since this tour and this is the best we can do at this point." For some bands, that's great. This is what they did at this time and it's a representation of them at that time and a recording of that time. We thought if do get a couple of more months then we could push ourselves as hard as we could. So we did.